My hands and feet trembled as I rushed with the rest of the students into the hallway. In the dim light, I was shocked to see gunmen on the first floor shooting everyone. I saw students falling to the ground. I realized it was too late to escape the gunmen, too late to escape death. Not knowing another way out, I followed everyone back to our classroom at the corner of the building. We lay on the floor. I called my younger sister, Alia, but received no response. Now my heart was beating even faster with worry. What if she had been shot? What if she was close to the explosion? My elder sister and my father called me and they were also concerned about her. I did not know she was in the same building, on the first floor. There was silence everywhere as we lay on the floor playing dead. Then somebody entered the hallway. I could hear his footsteps crossing the broken glass. Everyone was barely breathing. I heard the gunman push open the classroom door with his gun. But then he left and walked to the third floor. From 7 to 11 p.m., we waited. The police were calling to us, saying: “If someone enters your room, do not scream. It is the police.” Suddenly someone entered the hallway. He seemed to be angry and he was kicking classroom doors and firing his gun. We got up and pressed toward the window, pushing one another. Some people were jumping out the window. I was ready to jump, but when I got to the window, I saw bodies lying all around the campus. I saw my professor who was shot and was on the ground right below our window. I saw an armed man; he was one of the Taliban. I returned to my place on the floor, covering myself with my bag so only my head was exposed. I thought if the gunman shot me, then it would be better in the head so I would die without feeling pain. I heard someone kick the door in the hall next to us, but it was dark and the Taliban did not come to our class. They went up to the third floor. At 2:20 a.m., I got a message from my father that they had found my younger sister and she was crying for me. It was then when my first teardrops fell from my eyes. I cried for a few minutes, but then the fighting erupted again. The Special Forces had reached the second floor and the Taliban were in the next room where we could hear shooting and then they started using explosives. The Special Forces threw four grenades into the room where the two Taliban were hiding. It was silent; one of the soldiers told the commander that they must be dead by now. After a minute I heard two of them walking slowly down the hallway on the broken glass. Suddenly a Taliban started firing and I heard the two soldiers screaming and falling down on the glass. Then everything was quiet again. My left hand was totally numb; I could not move it at all. My father called me again, but I could not answer his call anymore. As the grenade explosions and firing started again, I put my head on the ground and covered my other ear with my hand. It was traumatizing to hear the brutal noises of gunfire, grenade explosions, and the helpless students around the campus. I thought these were the last few minutes of my life. With no control over my tears, I wondered why it had to end like this. I was tired, and hoping they would just enter the room, shoot us in the head, and end this nightmare. After another long hour of fighting, the soldiers managed to kill the insurgents hiding in the room next to us. When we came out of the classroom, the hallway was full of dust, broken glass, and blood. I saw the blood of the soldiers who were shot by Taliban. There was more blood in the stairway. On the first floor where the students had been shot in front of my eyes, I saw blood again. At the exit door, there was the dead body of one of the Taliban wearing a police uniform. As I was walking, I slipped and fell on a body. The soldiers helped me get up. Gunfire could still be heard from the third floor. Outside, I called my father. It was 3:40 a.m. when they picked me up. I hugged my father. I could not stop crying; that was the only thing I really could do that night. I saw my mom crying and then my sisters. I got back home at 4 a.m., still not believing I survived. I don’t know if I will be ever able to walk on the campus where I saw dead bodies everywhere, or enter the hallway where I saw blood of our hero soldiers who died rescuing us. I don’t know if I can enter the classroom where death was so close to me. 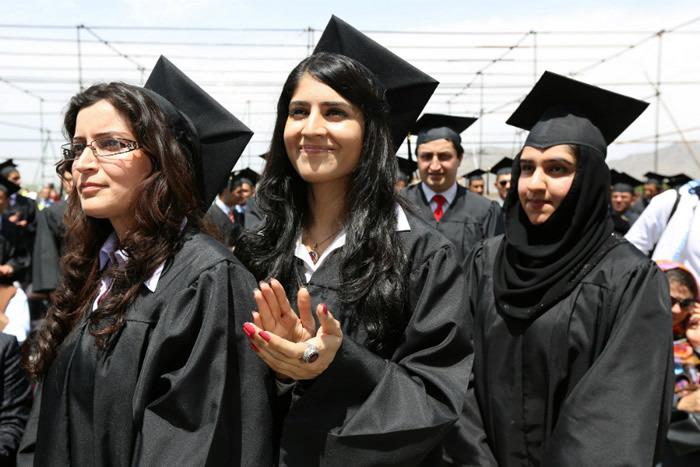 But I know that I am determined more than ever to continue my education, which will be my only weapon against Taliban. Photo by US Embassy Kabul. Your story is chilling and horrific and heartbreaking. It makes me cry to read what you experienced and continue to experience in the aftermath. So horrible! Thank you for your bravery in writing this down and reliving it as you did. We need to know what terrorism is like. I applaud your determination to arm yourself with education. I hope you will find a way to return to your studies. I will keep you in my thoughts and heart. I learned that people’s lives can go that fast. I have never been in a situation like that. yes I am inspired by the person who wrote this because they were brave in sharing their story. How did you find the courage to return from school? Believe in your bravery and your resilience. If the Taliban can frighten you away from an education, they will have won. Use every tool for healing that you can find, including writing your truth, and the knowledge you are loved and supported by family, and by total strangers such as me. Keep writing! Your story is unbearable to read, yet you and all who were there have no choice but to bear it. Thank you for your immense courage in writing, so that all of us can stand with you as you suffer. Please know you are not entirely alone – we hear your voice and pray with you for an end to such brutality in the world. The voice of women is what is most needed in our unbalanced world, and your extreme courage to speak out is what will bring peace, in the end. Your writing is so clear and precise, I’m grateful to you for being able to tell us about this horrific experience. Still, it’s hard for someone who hasn’t lived through such a thing to truly imagine it. This brutality. I tremble as I find the words to write. I jump as I read your words of fear. Your story dragged me in as if I was right there next to you in pain. Heroically you took responsibility, for not only your safety, but your father and your little sister. Your concern for her lead you to fight for your life. I envy your strength and fortitude to write this piece. I admire how you prioritize your education and I believe you will break the boarders of greatness. My prayers go to you, your family, and your friends. You have suffered immensely throughout your lifetime; though I really can’t say that what you’ve suffered is unique; many people hardship similar or worse everyday. Regardless, you should feel proud for surviving that horrible tragedy- and staying calm- many people would have broken down in that kind of position. Though I will also admit that you may have been very lucky- I mean, what were the chances that both you and your sisters survived. Either way, I hope you’re currently doing well and that you had the courage to share this terrible story with us. After reading this passage, I feel shocked by how dangerous the experience you have faced. I never imagine such thing can be happened in real life. Even though I never experience similar situation to yours, I still feel horrified while reading your passage especially when the gunman was shooting the innocent people and your professor died. That makes me think about what I will feel if someone who is close to me suddenly died in front of me, and I don’t think I can hide as much emotion as you can. I am surprised you can remain calm in such a dangerous condition and select the best choice. This essay sends a very strong message for many reasons. The violence is said to have lasted hours and the fact that Arifa and many others had no choice but to endure the attack, exemplifies the merciless horror the Taliban puts people through, and the effectiveness of the Taliban as it took a very long time for their attack to be ended. Arifa’s resilience and unyielding attitude is expressed in the last sentence, “But I know that I am determined more than ever to continue my education, which will be my only weapon against Taliban.” This sentence is powerful as it shows that there is hope for the citizens of Afghanistan and that not all of them are going to be compliant. As long as people continue to rebel against oppressive powers, there is a chance of salvation in the future. I hope that you achieve all your intelectual amibitions and serve as an example for others in the country. Your story shows the true tragedy that the War has on people. I, myself, would probably not be able to get through this experience. Thankfully, your writing is informing people all around us about the War and the toll it takes on people. The War in Afghanistan needs to end so these situations stop being a daily routine. As you said, “we think of gunfire as routine.” No place in the world should have gunfire as a daily routine. I hope you continue to write about your life in Afghanistan so that people can see the tragedy of life there. After reading this passage of your perspective, it really showed me how much people are suffering.This event is horrible and the fact that the people had no escape and had to endure the horrible reality of how they saw many dead bodies is really terrible. It also shows how often violence occurs when it says that they were used to gunfire. It shows that the people there are accustomed to witnessing this violence and the suffering they have to go through. The fact that they think gunfire is usual is very sad and it really shows how different parts of the world are suffering. I read your story and I feel really concerned about it. I find it disturbing how violence is so common over there. I’m really shocked with your story. Have you told this story somewhere else? I hope you get through all of it. This essay sends a very strong message for many reasons. The violence is said to have lasted hours and the fact that Arifa and many others had no choice but to endure the attack, exemplifies the merciless horror the Taliban puts people through, and the effectiveness of the Taliban as it took a very long time for their attack to be ended. I am awed by your strength and courage in writing this piece. Thank you for sharing your story. Your story has touched the hearts of many. You’ve shown us the truth of what the women and men of Afghanistan face. How you spoke about what had happened to you truly shows how much courage you have in you. To many other people, what you have gone through seems to be impossible. I cant imagine what it was like to be attacked like that, much more be attacked to violently in a classroom. I am astounded by the strength you have. To be able to recover and move on form such a traumatic incident like that is amazing. I’m sure that many women out there, even those women in Afghanistan who don’t know about sites like these, are very proud that you have used your voice to speak on their behalf. Just by reading your story makes my heart quake. I cannot have imagined how would I take action being in the same situation as you. Hearing about events like this happening on the side of the planet makes me feel heartbroken. A place that can be said to be so far away from me, but yet so intimately connected by the spirit. Fighting for education with my life is something that I have not even dared to think about, but other brave young women who have not yet begin the colorful part of their life are risking towards it. Arifa, thank you so much for sharing such of a thrilling experience that inspired so many of us out there! Your story is unimaginable for me and is very powerful for everyone who has the chance to read it. You have so much strength and power for taking a stand and telling everyone about your experience showing people what goes on outside their bubble. Your story shows the reality of life. Every word you included changes many perspectives including mine. Hearing gunshots every day is a nightmare to me, allowing the reader to see the cruelty and actuality of the world we live in. A world where nothing is fair, just, perfect, or equal. A world in which many people live. Your last sentence gave me more perspective on your need to learn in this mess of a world. Stating that no one will stand in your way of you and your education is so powerful and beautiful because you show the importance of your future through that decision you made. Your unstopping passion for school and learning no matter what experience is inspiring. So many kids today do not take full advantage of school by not trying which can impact their future. But you state that no matter what you encounter that you will still fight for your school to better your life and your destiny. Your story allows many viewers to see a regular day of their life is someone else’s dream life. Thank you for sharing your story with the world and opening peoples’ eyes to see the truth behind an Afghan life. To Arifa, your story is a tale that is hard to hear but one that must be told. In war, both sides inflict pain and attack each other out of ignorance but your voice reminds others that the only true cure for ignorance is education. At the end of the day though, you’re at war too. You may not be in combat on the battlefield but you are fighting every day, fighting for your basic rights and it is that fact that makes your message so much more powerful. You deserve the right to walk your streets without fear and the right to learn as much as your heart desires, something most people take for granted in other parts of the world. Towards the end of the article, I can feel the passion radiating from your words. It’s like all that others do to stop you is only making you stronger and empowering you to fight your oppression. At the end of the day, you and people like you will always win Arifa. Its young spirits like you that empower change. While others can promote violence and use any weapon the mind can conjure, they’ll never be able to crush the power of knowledge and the spirit of education within you. I can’t even begin to imagine the terror and fear you witnessed first hand. The incident you describe is truly disturbing, and I admire your courage for sharing it with the world. No one should ever have to experience what you have been through, and the bravery you showed during those events is remarkable. Thank you for exposing the terrible and horrific effects of war and conflict on society and civilians. I also commend your resolve to continue your education in spite of the events that occurred at AUAF. I couldn’t agree more that education is an extremely powerful tool in the fight against terrorism, ignorance, and I’m glad you decided to continue against all odds. I would like to thank you for being able to share your story with the public. Being able to share your story is able to show others (myself included) what a difficult time the world is in. YOur words are able to inspire others to come forward and express their experiences to help others understand your pain, as well as, create questions for others to use to help advocate for the end of horrific things such as this. I personally want to say that you have been able to help me realize the suffering and sorrow that others go through every day, as well as, inspire me to try helping others. Wow. This is one truly horrifying experience. I admire you for staying strong and sharing this to the world, as it will teach others the horrible experience of your own school, being attacked. This story shows a unique perspective of a school attack, and it makes it seem like you are actually there. Although nobody should experience this, I think that this justifies that school shootings are no joke, and this story should be taken to heart. You survived, despite all odds being against you. I am sorry for all of the people that died in the attack, and hopefully, they are in a better place. Nobody should ever have to go through what you did. It’s saddening that anyone would stoop low enough to attack a school. Children shouldn’t be used to the sound of gunfire. A school is supposed to be a place of learning. People should be able to attend without the fear of being attacked. I am glad your sister is alright. You must care about her a lot. You’re a very resilient person and are very brave. By taking a stand against the Taliban, you’re helping empower other women and are change the culture of Afghanistan for the better.